If you are training for a long-distance running event or triathlon, you may have learned that there’s more to training than just the physical aspects. Training plans focus on the workouts you need to perform to be ready for race-day, but what about triathlon and running nutrition? 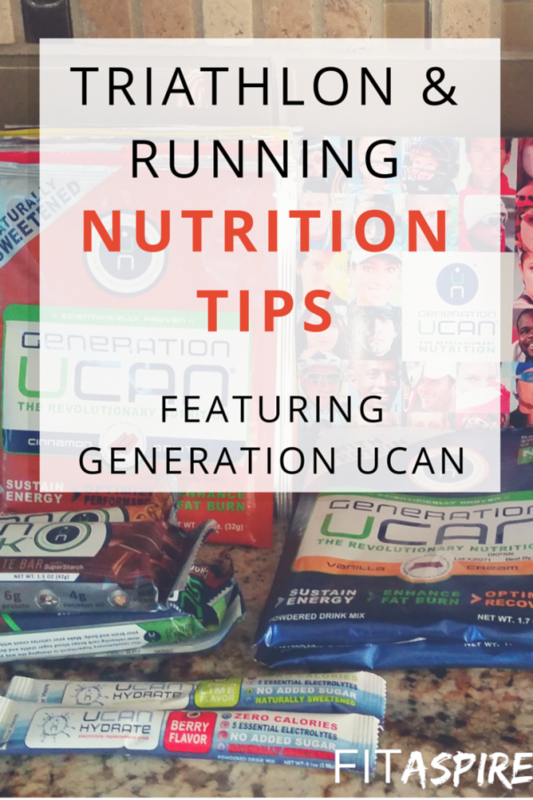 Don’t miss the discount and giveaway at the bottom of this post, which is sponsored by my friends over at Generation UCAN! With long-distance training and racing, nutrition becomes an important part of your success. When your training sessions cross that 90 minute mark, you really want to think about how you will fuel your body to be sure you continue to perform your best. There are two different strategies you can take to manage your blood sugar for endurance training. I tend to prefer the second option below, as many of my athletes (myself included) also have body composition goals in mind. This strategy can help make sure your muscle and glycogen stores are always topped off by eating a consistently high carb diet. The downside of this strategy is a chronically high carbohydrate diet (especially refined carbs) can also lead to elevated triglycedride levels, LDL cholesterol, and insulin resistance. That last one makes it particularly difficult to manage your body composition. This strategy is focused on managing your blood sugar by eating the right carbs before and during your workout or race. This helps manage the downsides of a high carb diet by prioritizing them when they’re needed, instead of a high volume when they are not. 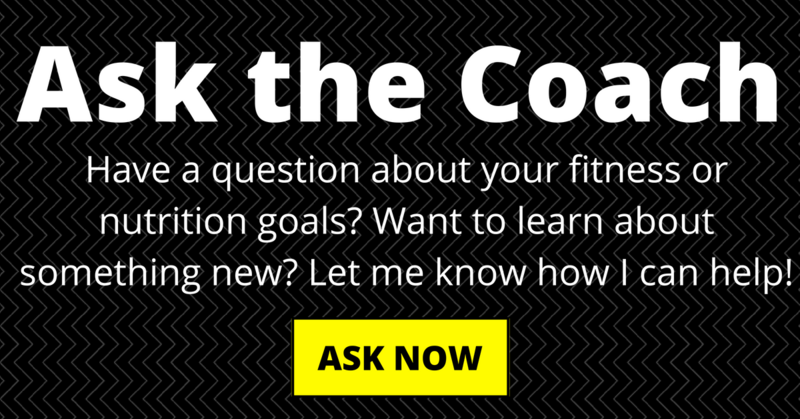 This means you are able to manage the downsides above and avoid the fat gain that can result. While endurance training is not the most effective for fat loss, keeping your insulin sensitivity in check will help increase your chances of success and at least maintain your progress. No matter what nutrition product you choose, one of the key factors is finding a product that your body can process. For the first 5+ years of racing, one of the biggest issues I faced was finding a running nutrition product that didn’t cause GI distress. I tend to have a sensitive stomach when training and racing, so this was a really tough one for me. Over time, I learned that products with high sugar content (particularly maltodextrin) cause cramping and pressure for me. If you are gluten or dairy sensitive, you will want to find a product that does not include these ingredients, as well. Now that you know the purpose of your triathlon and running nutrition and what to look for (depending on what strategy you choose), the next question is how much do you need. Each product seems to recommend a different amount, but your goal is to consume just enough that your energy (blood sugar) stays constant throughout your workout or race. If you take in more than you need, your chance of GI distress increases and those excess calories go to waste (which can lead to weight gain). If you take in less than you need, your energy will dip and your performance will be negatively impacted. This one may take some experimentation during training. You can try to reduce your nutrition intake during training sessions until you hit that threshold for your own body. Remember to test this on higher intensity sessions, as well, to mimic race conditions. Another question I hear quite often is what nutrition product I recommend for endurance training. This is always a hard question, as triathlon & running nutrition is very specific to the individual. What works well for me, may not work well for you. Or you may not like the flavor or the texture of the product. You really do need to experiment with nutrition in training to find the right product for you. 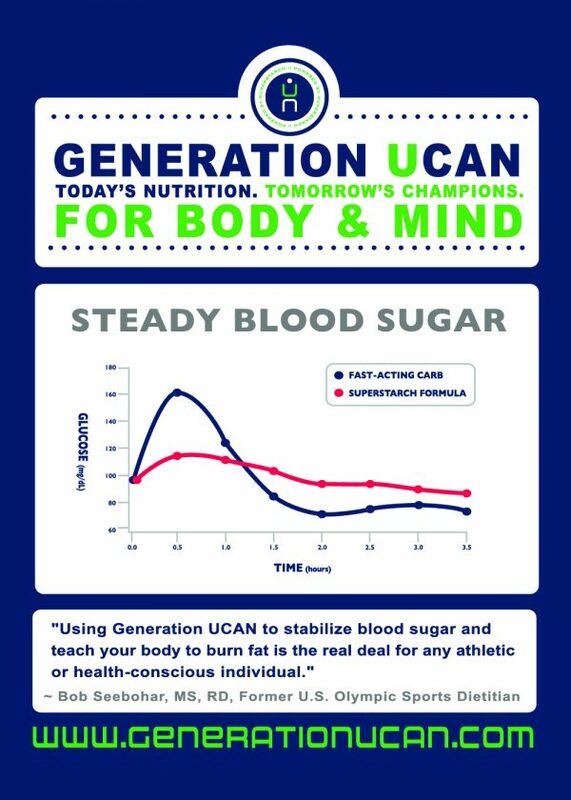 But, if you want to know what product I am currently using and recommending to my athletes, the answer is Generation UCAN. I was introduced to this product by one of my current athletes and I reached out to the company to sample their products. I tested the products (focusing mainly on the two drink mix varieties) for almost 6 weeks in training and racing for a sprint duathlon and half marathon to really see how this worked for me. Since then, I’ve been recommended it to my athletes looking for the right triathlon & running nutrition. The feedback from everyone who has tried it has been great! The background on this product is pretty interested. It was originally developed for children with life-threatening hypoglycemia to help manage their energy levels. The founders of the company were looking for a product for their son, who was tube-fed every 2 hours to maintain normal blood sugar levels. The SuperStarch that was developed is derived from hydrothermally treated non-GMO corn and helps maintain blood sugar levels for the longest period of time. It was only later that they decided this might also be a great solution for athletes! An independent IRB study at the University of Oklahoma showed that SuperStarch delivers a steady release of glucose that significantly lessens an early spike in blood sugar and steady glucose levels. For endurance athletes, this means we can easily manage our blood sugar in training and racing! I have found this to be true in my own experience with the UCAN Drink Mix & Protein Mix. During training and racing up to 2 hours with one serving, my energy is steady and I don’t even need to refuel along the way. Going back to the question of how much you need, I use one serving mixed with water about 30 minutes before a long workout (anything 90 minutes or longer). That’s 130 calories per serving, which lasts me 2 hours! Previously, I had been using 1 gel every 45 minutes for similar training, which was 100 calories per serving. That means I’m fueling with 70 calories less without sacrificing any energy. 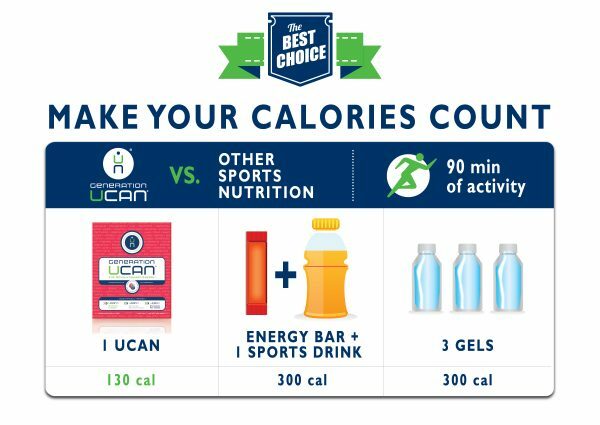 The chart below shows other common fueling strategies and the calorie difference you would expect with UCAN. 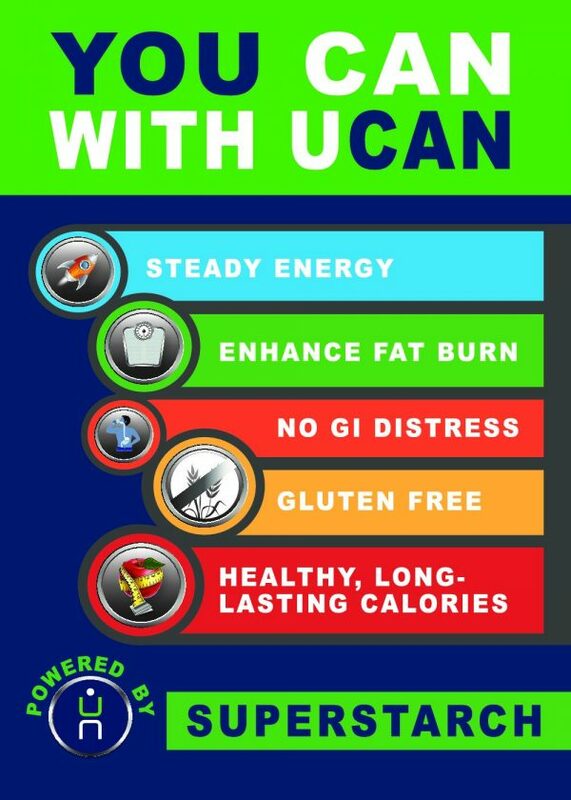 I primarily use the drink mix products in my training – both the UCAN SuperStarch Drink Mix and the Protein Drink Mix. On mornings when I’m getting up to run immediately, I use the Protein Drink Mix with water 30 minutes before my workout. If I’m eating breakfast first and racing or running a little later, I’ll have a light meal and then the SuperStarch Drink Mix 30 minutes before my workout. As you can tell, I’m a pretty big fan of the products and plan to use it myself for all endurance training. I know from experience how hard it can be to find a triathlon and running nutrition product that works for you, so I hope this may be the answer to your own search for the right product for you! And to make trying this a little easier, I have two TWO ways for you to try UCAN — a limited-time discount and a giveaway!! Disclaimer: This post is sponsored by my friends at Generation UCAN. Thank you for allowing me to continue creating great content for you by supporting partnerships with brands I love. As always, opinions are 100% my own!